Free XPages Training Course from TLCC, the leader in XPages Training! Free Course - Introduction to XPages Development! Wondering what all the buzz is about XPages? Find out for yourself with this FREE course!!! Introduction to XPages Development (8.5) covers the basics of getting started with XPages development using Domino Designer 8.5. This course is for experienced Notes and Domino developers who have limited or no experience with XPages development. 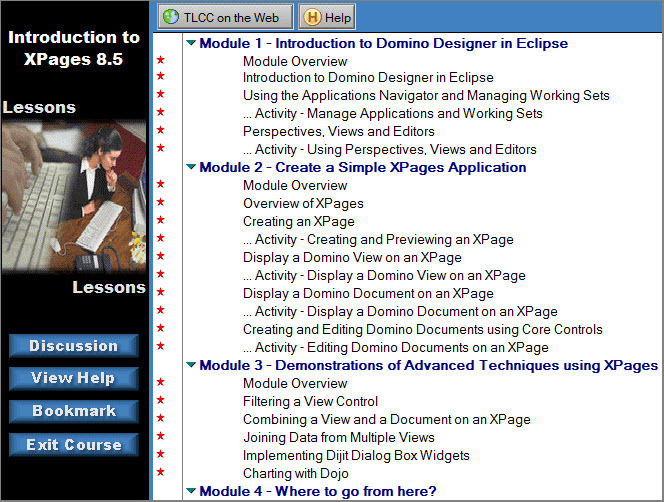 Domino Designer 8.5.1 or higher is required to be installed before installing this course. This can be obtained at no-charge from IBM. To sign up for this course use the link below. You must be registered at TLCC's site. If you are not registered, use the link on the login screen to get a new account at the TLCC site. Introduction to XPages Development is for experienced Notes and Domino developers. If you are new to Notes and Domino development then take the Introduction to Domino Designer 8.5 course. This course also includes a module on XPages (the Introduction to XPages Development course is a subset of this course, so you don't need both)!